What are the cheapest ski localities I can go in a weekend if I live in Amsterdam (in the Netherlands). I want reasonably good ski runs (I'm not a beginner), and outdoor. Should I go to France? Austria? Any tips? I've seen there are some localities in Germany, but I was wondering if they are so attractive. There is a daily train leaving Amsterdam at 20:31 and arriving in Munich at 7:10 the following day. The trains leaves Munich at 22:47 each evening and arrives in Amsterdam at 8:56. The price very much depends on when you travel, when you book and how much comfort you want to have. Details can be found on the Cityline website. From Munich you can take a local train to Garmisch-Partenkirchen, at the foot of the Zugspitze. It's a 90 minutes ride. Schedules and prices can be checked at the Bahn's website. The train continues to Innsbruck. You can consider that as well. In this case, take an accomadation in Innsbruck. There is a small ski resort, the Patscherkofel, accessible from the city center by funicular and cable car. If that's not enough, you have some nice resorts which can easily be reached by a bus shuttle from Innsbruck, such as the Stubaier Gletscher, Schlick 2000 or Axamer Lizum. This way you can spend a nice skiing weekend without having to renounce to the amenities of a city. The train also calls at Wörgl, from where you have a very quick access to the very nice "Wilder Kaiser" resort. In case you don't like to take the train, flying from Amsterdam into Munich will probably not ruin you. But it's much less convenient. From Munich airport to Garmisch-Partenkirchen is more than 2h30 and you have the usual airport hassle. And probably less convenient schedules. The night train allows you to get the most out of your scarce time. If you are francophile, you can consider a flight to Geneva. With Easyjet you will find decent prices. From the Geneva airport you have bus shuttles to plenty of French and Swiss resorts. This will take you 1h30 to 2h00, depending on the destination. Schedules are available on the homepage of Geneva's airport. If "cheapness" is an important criterion, prefer France over Switzerland. I would also try to contact local tour operators and travel agencies. Chances are high that they have ready made packages just for short ski trips. Eventually, that might be the most convenient option. You just have to go to the office and book it. They take care of the logistics. It is not necessarily more expensive than if you try to brew something by yourself. 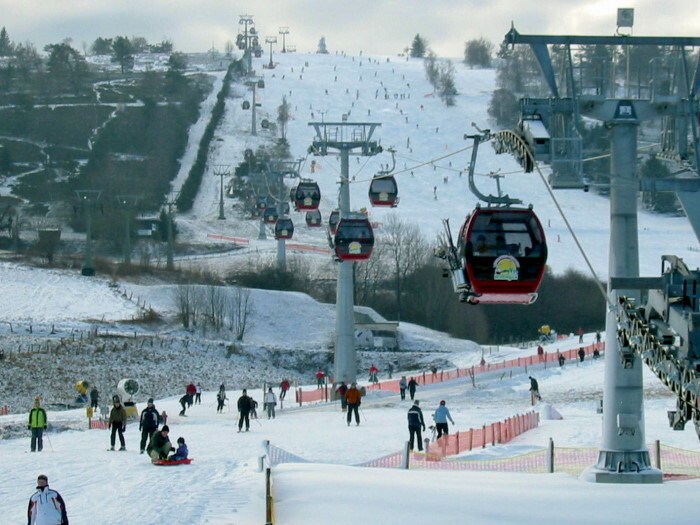 I'm not a winter person but I heard on the news that many dutch people come to Willingen Hochsauerland for skiing. That is a 4h ride from Amsterdam by car. The longest ride is 2km and an altitude difference of 240m. They even have floodlights to ride at night. I don't know if it will have sold out yet, but if you're quick probably the best bet is the Thalys Snow Train. Tickets start at €69 one way, from Amsterdam to Chambery, Albertville, Moutiers, Aime la Plagne, Landry and Bourg St Maurice. Most of those are either in ski regions, or a short bus ride away. The Seat61 Snow Train page has good connection advice from those stations to the ski areas they serve. Next up, look at booking a cheap train ticket to Paris (ideally advanced purchase Thalys if you can get it), then either an overnight train or daytime TGV down to the French Alps. Booked in advance, you can get from Paris to the alps for about €35 (non flexible, advanced purchase Prems ticket). Another option is Switzerland. Take a Thalys down to Lille, then connect onto a direct TGV Lyria to Visp or Brig, for a local train to places like Zermat. See the Seat61 Skiing in Switzerland by train page, but you'll want a cheap Thalys ticket to Lille rather than the Eurostar. Many of the chalets and hotels in the main ski regions prefer week long bookings at peak times. However, not all do, so hunt around! Some do offer short stay packages for 2-4 nights, a google for "short stay chalet " will normally help you find some. Also, don't forget that most mountains have more than one side that you can ski on, so remember to check prices in resorts on both sides as you can often find a big price difference! Fly to Norway with KLM. It will set you back some $300 for a return ticket from Schiphol - on a good day. Three daily flights to/from Amsterdam. Flying time is a little over two hours. Take the train to Oppdal in Norway in Sweden Storlien or Åre. Oppdal and Åre are the biggest and better of these three. Your budget should allow for train transport with NSB (all destinations available from them), hotel and food. All of it rather expensive in Norway. Fly to Innsbruck. It is relatively cheap, you can fly from Rotterdam (small airport, so no 2-hour queues) and the ski area is directly north of the city. There are tour operators that organize ski weekends -- leave friday evening and drive during the night (sleep in touring car), ski on saturday, sleep in apartment or hotel, ski on sunday, drive back the night after (sleep in touring car again). Price usually includes a pass for all ski lifts. I doubt you can beat the price of such trips by organizing it yourselves. One that I know of is http://winter.bizztravel.nl , they don't have many winter vacations on the site yet, probably will in a month or so. Depending on the number of people you travel with (sharing an apartment), somewhere around 200 euro for the weekend should be doable. Usually the resorts in the French Alps are higher and thus more snow safe, and the hotels are usually right at the ski lifts. Austria is somewhat lower, not as snow safe, you stay further from the lifts (there are free buses though), but there is much more partying and more relaxed away from the skiing. Not the answer you're looking for? Browse other questions tagged budget europe netherlands skiing or ask your own question. Which European resort has the best pistes for beginner to intermediate snowboarders? From Amsterdam (Netherlands) to Lima (Peru) by flight? What's a cheap, convenient way to get from Amsterdam to Brussels? Are there any guest houses close to the Buddha Park in Vientiane, Laos? How can I reach Muiderslot castle from Amsterdam Central? Cheap way to get from Amsterdam to Prague: train? What are these huge ‘fields’ of light just north of Amsterdam?